it's that time again, baseball fans! time to rank the best of the best in Major League Baseball by position. MLB Network began airing their annual Top 10 lists last Sunday, which was oddly changed from Thursdays in past years, i might add. 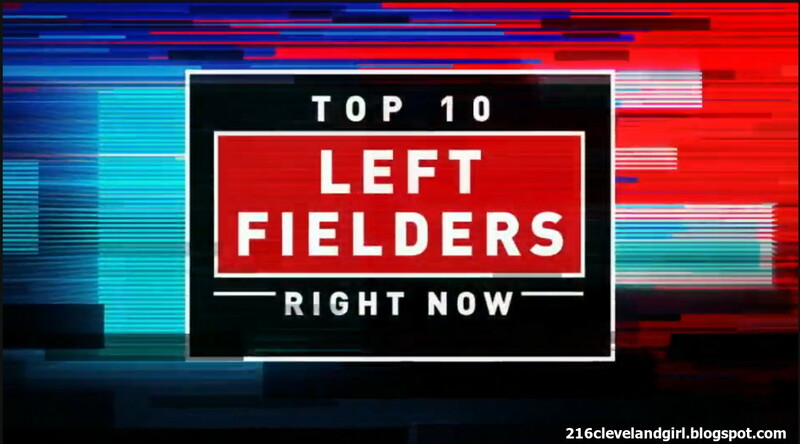 and tonight, on January 22 at 10 pm ET, their "Top 10 Right Now: Left Fielders" show premiered. a player's recent performance and projected performance for the coming season. 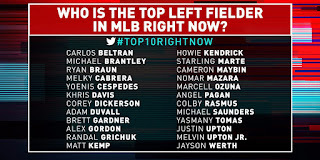 all of MLBN's Top 10 lists include both American League and National League players, making those coveted 10 spots tough for some players to obtain. alas, that typically leads to baseball analysts and fans alike often disagreeing with The Shredder. au contraire, the resulting debates and conversations in relation to why The Shredder is right or wrong can be quite enlightening and informative. 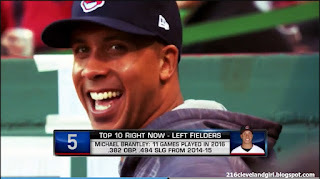 at 10:24 pm, i was excited to see Michael Brantley was ranked the 5th best Left Fielder in the game right now by The Shredder! congratulations, Michael! i'm so happy to see that you are still being recognized as one of the best LF in the game even though your 2016 season was marred by injuries and setbacks. this really speaks volumes about Michael's reputation and offers a hopeful presumption that he will make a comeback in 2017.
what do you think about this Top 10? do you agree with The Shredder's choices and rankings? and what about Michael's placement? leave a comment below and let me know! Brian ranked Michael at #6 while Eric did not rank him (due to lack of play) on their own personal Top 10 lists. a sabermetric superpanel also weighed in with their expertise. 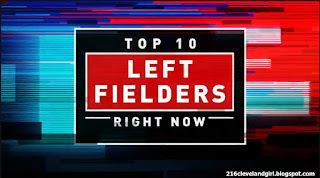 MLB Network had special guests Bill James (Boston Red Sox Senior Advisor & President of Baseball Operations), Vince Gennaro (SABR President), and Mike Petriello (baseball analyst, MLB.com) in the studio and they unveiled their Top 10 Left Fielders lists in the second half of the show. Bill had Michael at #9, Vince had him at #10, and Mike did not rank him at all. the three men gave the same reasoning for their decisions of Michael's low (or no) ranking, that being because of his shoulder issues. in addition, there was a fan vote for the first time this year. 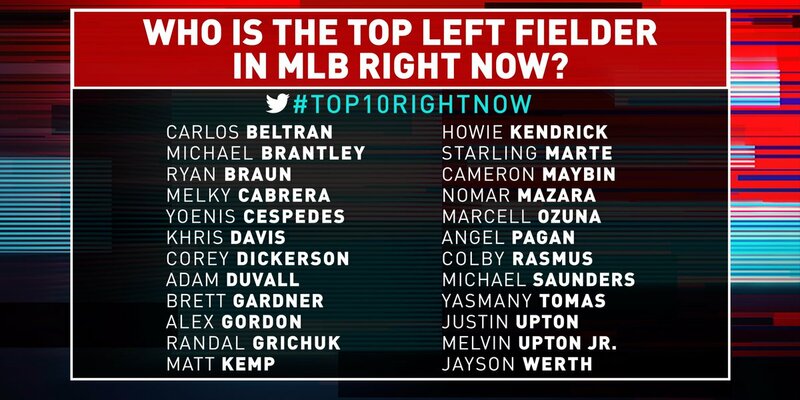 fans made their selection for the Top Left Fielder Right Now by tweeting the name of the player and using the hashtag Top10RightNow. it goes without saying that i voted for Michael, and the overall results showed the fans had him at #3. hell yeah! more Brantley Believers, i love it! going into 2016, Michael was #1.
going into 2015, Michael was #3.
going into 2014, Michael was not ranked. now for my thoughts. normally i fight tooth and nail against these lists (aside from last year), but i honestly don't have a problem with this and i saw it coming considering Michael only played 11 games in 2016 thanks to right shoulder and bicep troubles. The Shredder's list is heavily dependent on a player's stats from the most recent baseball season. so how could anyone, including me, expect Michael to rank high on this list, let alone repeat at #1? it was never gonna happen. frankly, i'm a bit shocked he placed anywhere on this list because i didn't know how missing almost the entire season would affect these rankings. apparently The Shredder is confident that Michael's going to make a hell of a resurgence, which brings me to my next point. the other main component for this list is predicted analysis for the upcoming season. as for looking ahead to this year, the truth is we just don't know how Michael will perform in 2017. despite those who insist they can formulate extremely accurate predictions, i wouldn't be surprised or offended if most of those predictions for Dr. Smooth were on the low side simply because he's gonna be coming back from another surgery. Michael's presently in the hitting off a tee phase of his rehab. therefore, i can't blame people for being a bit cautious. but i, as his #1 fan, am fully optimistic that he will not only return to game action, but get back to his 2014 and 2015 form. however, i'm well aware that there are fans who need to see it in order to believe it regarding Michael's capabilities in 2017, and some need to be convinced that he'll even be able to suit up and play again, period. 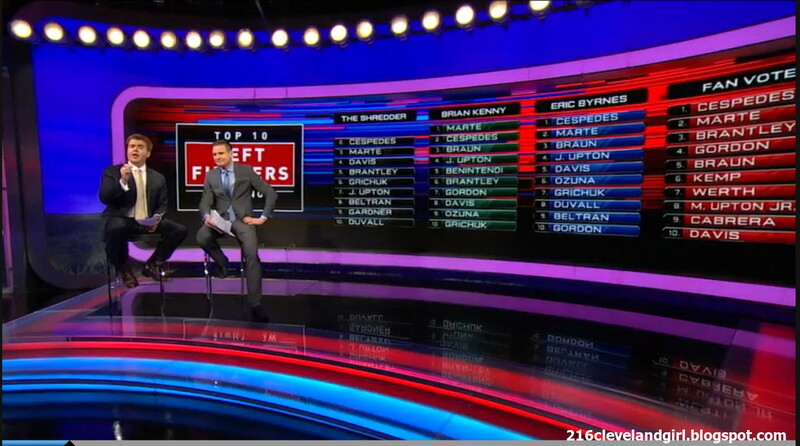 MLB Network will be broadcasting their Top 100 Players Right Now countdown shows next month, and i am very interested to see where Michael lands on that list! FYI--i am tweeting every health update and hitting progression that i find about Michael @clevelandgirl23, so be sure to give me a follow for all that information. i imagine he will provide more updates on his current status while attending Tribe Fest this Saturday, January 28. then once this month has concluded, i will be posting another blog containing his rehab progress and other news from January. finally, you can sign up for my subscription list to receive new blog notifications by email if you should so desire. all you need to do is submit your email address in the box underneath the Blog Archive section over on the right side of this page.